In addition to three HDMI inputs to plug your electronics in and one output in order to connect to a display, you will also receive a coaxial output for an amplifier and a couple of RCA ones for a pair of speakers. Aside from the standard HD audio formats, the device supports some of the less orthodox options like LPCM and ARC, including an SPDIF output for the latter. A large amount of LED lights might seem somewhat distracting at first. If you're a huge fan of music that prefers to work with a large variety of different audio formats, and you appreciate comfort above almost anything else, the Tendak DA-H2H-156 might very well be the best HDMI switch for you. The model is a bidirectional HDMI switch, meaning you will also have the option of using the same connectors not just as inputs but also outputs, so you will be able to connect a single HDMI source to a pair of displays. Only 2 HDMI inputs or outputs. 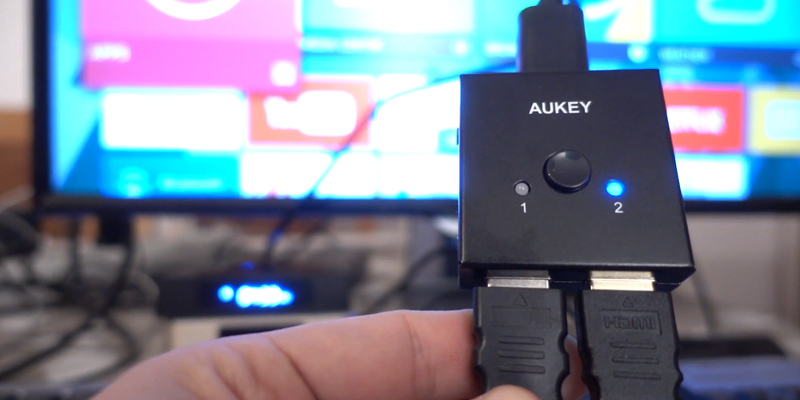 The Aukey HA-H04 is the kind of product you opt out for if you have a pair of devices you would like to use through an HDMI input and a couple of displays that you could plug in through an HDMI output. With just about 5.2 x 1.6 x 7.7 centimetres in overall dimensions and 54.4 grams of weight, you can just put the whole thing in your pocket and take it with you. Once you got it out of the package, all you'll have to do is simply plug it in and play since there's absolutely no need to set up any drivers in order for it to work. The model powers only through USB. 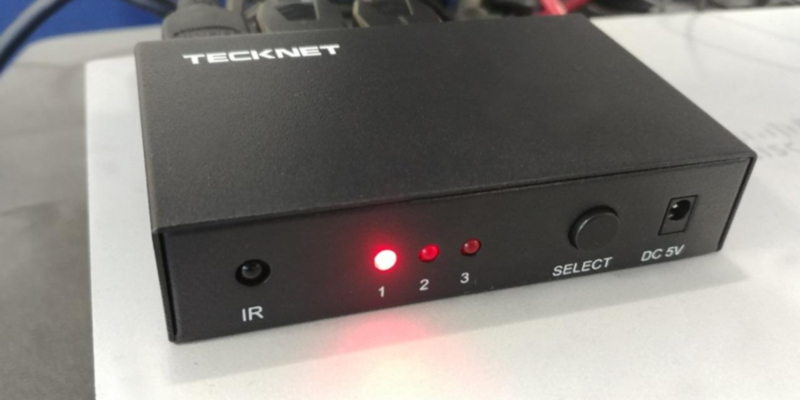 The TeckNet 3 Port is a rather interesting model. Its simplistic and straightforward design make it a great choice for people that aren't as acquainted with technology, while the auto switching feature makes it interesting for the more technologically-savvy crowd. The switch doesn't just offer you support for regular HD video and audio but also formats like LPCM and Direct Stream Digital. Aside from these audio formats, the device also works with 4K resolution (3840x2160P) and 3D video, which is quite impressive given its price. Shouldn't be used with HDMI cables longer than 6 metres. The GANA sw-3 is one of the cheapest HDMI switches out there but, despite that, it is a surprisingly outstanding product that delivers in terms of quality as well as it does when it comes to features and conveniences. 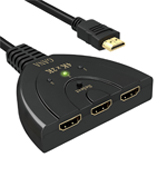 Along with a regular set of 3 HDMI inputs, this device also comes equipped with an additional input that can be used both for your regular HDMI sources like a laptop or a gaming console and for MHL (Mobile High-Definition Link) sources, meaning you will be able to enjoy your mobile content on a big screen. All of these connectors are coated in gold. The remote control lacks in terms of distance. The Goronya HDM.MTX.FBA001UK is the kind of quality model you could easily recommend to just about anyone looking for a switch, but an additional HDMI output makes this HDMI splitter switch an absolute must-have for those customers that own a pair of different displays and would like to utilise both of them. 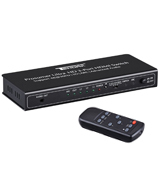 A powerhouse of HDMI switches, the Tendak DA-H2H-156 is the kind of device you get if you have plenty of different video sources and only a single display that you would like all of these gadgets to hook up to. As you would imagine, it is a sizable box, with 19.9 x 13.6 x 5 cm in overall dimensions and just under half a kilo of weight, and all of the bright LED lights might seem a bit distracting, but that is the price you ought to be willing to pay if you want a model capable of handling a whole array of devices with different protocols all at once. 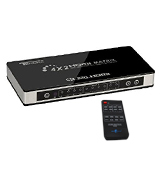 In addition to a standard set of three HDMI inputs to plug your electronics in and one output in order to connect to a TV set, monitor, or a projector, you will also receive a coaxial output for an amplifier and a couple of RCA ones for a pair of speakers. Frankly, one of the more impressive things about this HDMI switch box isn't its video capabilities since they're a given in a model like that but all of the audio formats that the model supports. 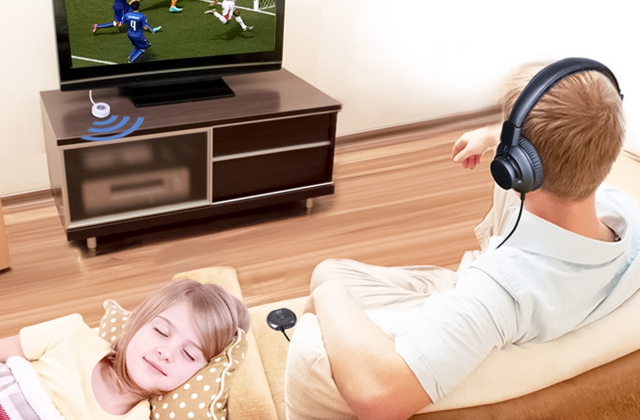 From your regular Dolby True-HD, DTS-HD, Dolby Digital, and DTS Digital to some of the less orthodox options like LPCM and ARC, this device supports them all, including an SPDIF output for the latter. 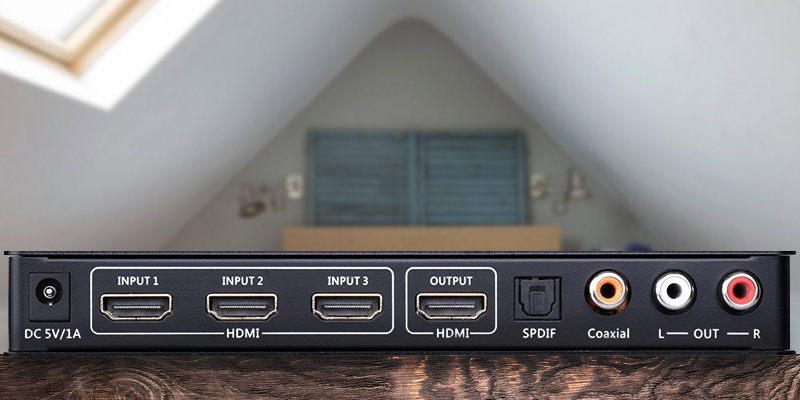 If you ever feel like browsing through one of the three HDMI sources, you will have the option of doing so by using buttons on the front panel or by utilising a remote control in order to choose the input you want. So if you're a huge fan of music that prefers to work with a large variety of different audio formats, and you appreciate comfort above almost anything else, the Tendak DA-H2H-156 might very well be the best HDMI switch for you. 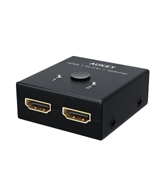 The Aukey HA-H04 is what is referred to as a bidirectional HDMI switch and what that means is, that just like any other device like that, it will allow you to connect multiple video sources to one HDMI display. But, on top of that, you will also have the option of using the same connectors not just as inputs but also outputs, so you will be able to connect a single HDMI source to a pair of displays. 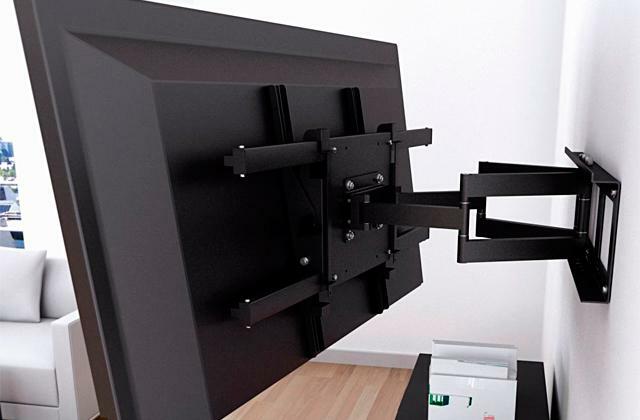 The difference between this model and the ones that serve both as a splitter and a switch is that it is utilising the same connectors, so you will have to toggle between two different displays since only one of them at a time will be able to present an image. 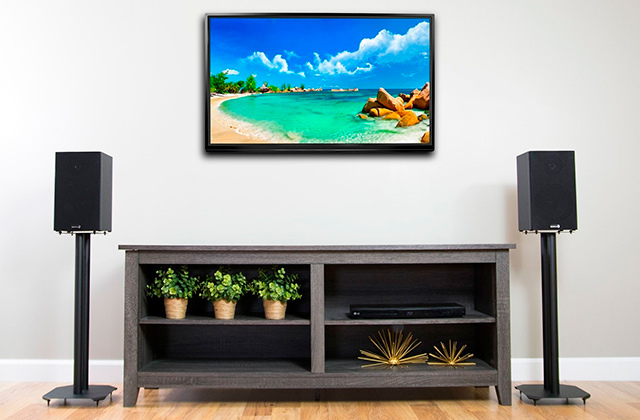 This type of structure makes it a great choice for those customers that do not own a variety of different displays and potential HDMI sources but would like you to use all of them from time to time without wasting money and space on a bulkier splitter model. 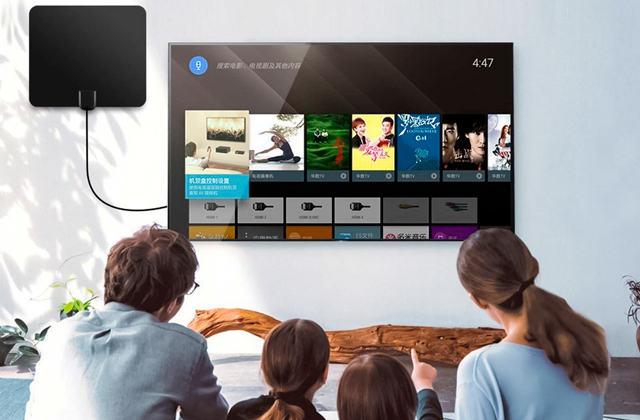 Besides all of these specifications, this HDMI switch box supports the latest 1.4 HDMI protocol, so it will be compatible with the absolute majority of devices with standard HDMI interfaces like modern consoles and laptops in terms of input and television sets and monitors when used as an output. 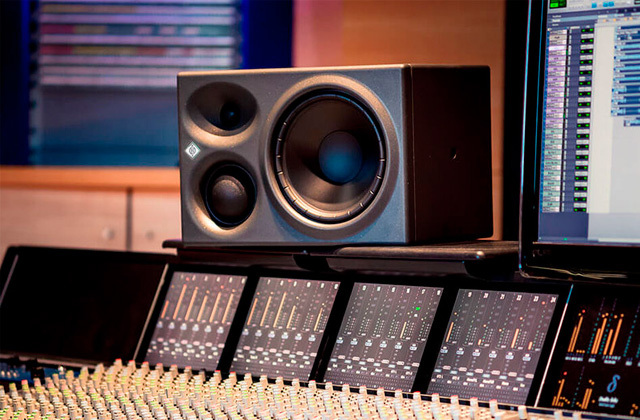 It supports the video resolution of up to 4k Ultra HD (3840 x 2160) and all of the HD audio formats like DTS-HD, Dolby TrueHD, LPCM 7.1, Dolby AC-3, and DSD. All in all, this probably isn't the best choice for you if you own a variety of potential video sources and would like to utilise all of them at the same time. 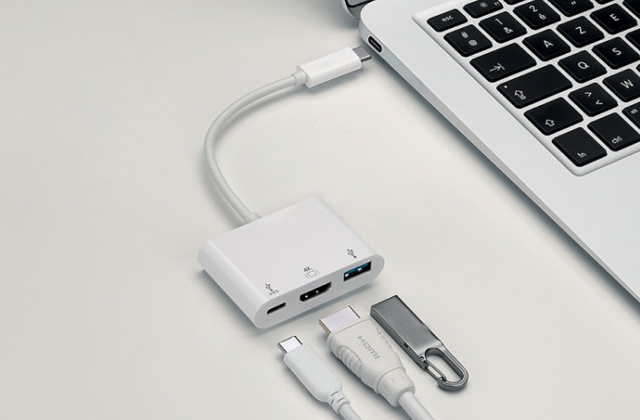 The Aukey HA-H04 is the kind of product you opt out for if you have a pair of devices you would like to use through an HDMI input and a couple of displays that you could plug in through an HDMI output. As with any kind of technology, an HDMI switch entails the same type of question about the amount of time it will take to get the whole thing up-and-running and how hard it'd be for an inexperienced person to set it up on his own. And if this is a priority for you, TeckNet 3 Port might just the perfect choice for you. What we have here is an incredibly simple and straightforward model that is unlikely to present any challenges to even some of the least tech-savvy people. The first thing you'll notice when you take the product out of the box would be how incredibly lightweight and compact this piece of consumer electronics really is. 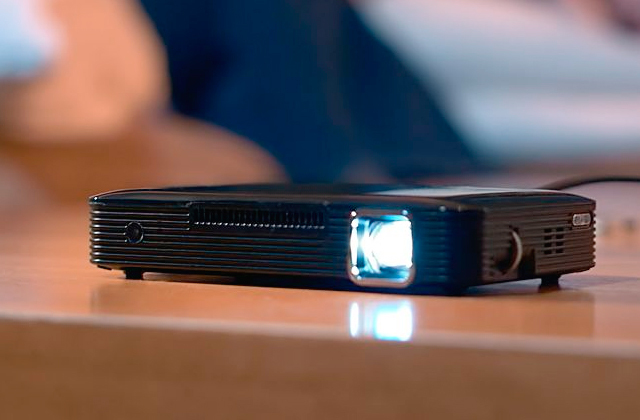 With just about 5.2 x 1.6 x 7.7 centimetres in overall dimensions and 54.4 grams of weight, you can put the whole thing in your pocket and take it with you wherever you go. After you got acquainted with the model, all you'll have to do is simply plug it in and play since there's absolutely no need to set up any drivers in order for it to work. Though incredibly straightforward, the manufacturer also made sure to add a user manual to the package, in case you ever manage to run into some kind of a problem. 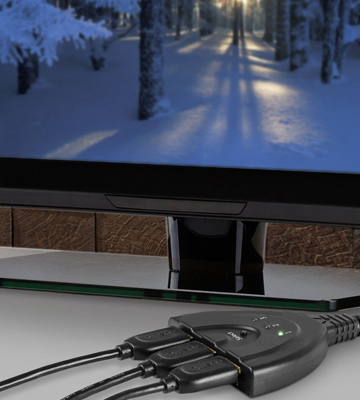 Aside from a regular set of HDMI inputs and a single output, both of which support the absolute majority of standard HDMI devices, the thing that makes this model interesting is an auto switching function. 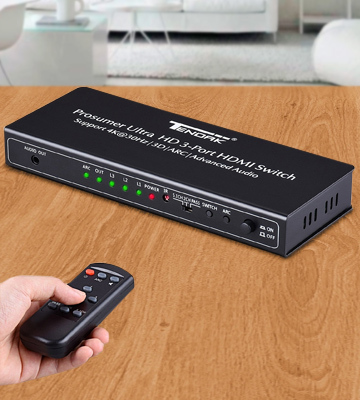 If you press the required button, this automatic HDMI switch will switch between different video sources on its own and you won't have to do so manually every time you'd like to change the source that is being displayed. In conclusion, the TeckNet 3 Port is a rather interesting model. Its simplistic and straightforward design make it a great choice for people that aren't as acquainted with technology, while the auto switching feature makes it interesting for the more technologically-savvy crowd. One of the most alluring things about this product is certainly the kind of price tag it comes with. For less than 10 pounds, the GANA sw-3 is the sort of HDMI switch that you could purchase even if you do not currently own a set of different devices that could serve as HDMI sources. 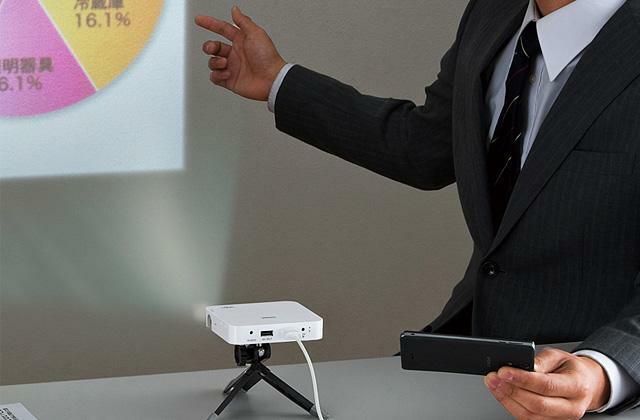 Aside from that, the device is tiny and it doesn't require an expert to operate. Furthermore, you won't even need an additional source of power. Just plug the thing in and the model will be able to receive power from the source devices through the HDMI ports. As you might imagine, there's no need for any drivers or any sort of software as well. But, with a device as cheap as this one, there's always a healthy amount of suspicion in terms of its quality, given that most people often associate an affordable price with a subpar product. Well, fortunately enough, this isn't the case here since all three of HDMI inputs and an HDMI output are presented in a form of 24k gold-plated connectors that resist corrosion, reduce tarnish, and increase transmission performance, so you won't have to worry about any distortions as far as audio or video are concerned or any delays in signal transmission. And the latter is quite important, especially because the model doesn't just present you with a support for regular HD video and audio but also formats like LPCM and Direct Stream Digital. Aside from these audio formats, the device also works with 4K resolution (3840x2160P) and 3D video, which is quite impressive given the kind of price range this product belongs to. And that's about all there is to it. The GANA sw-3 is one of the cheapest HDMI switches out there but, despite that, it is a surprisingly outstanding product that delivers in terms of quality as well as it does when it comes to features and conveniences. 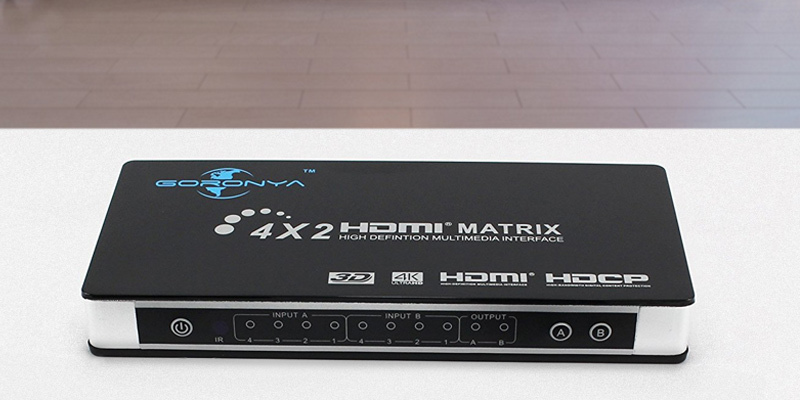 Now, the Goronya HDM.MTX.FBA001UK is a bit of a different option compared to most other HDMI switches out there. 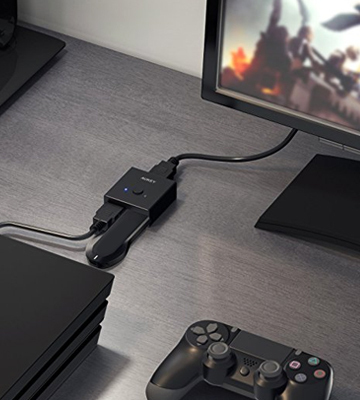 To start with, the model comes equipped with two HDMI outputs, and that alone already makes it an HDMI splitter the same way three HDMI inputs make it an HDMI switch. So, if you don't just have a single preferred television set and instead own a couple of different displays that you would both like to use, this kind of a splitter is exactly the type of device you should choose. But, if you know your stuff and all you're looking for is a simple switch, the model in question will still work wonders, though we certainly wouldn't describe it as simple. 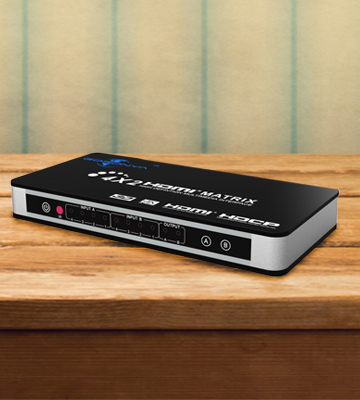 Along with a regular set of 3 HDMI inputs to connect a variety of different video sources, this device also comes equipped with an additional input that can be used both for your regular HDMI sources like a laptop or a gaming console and for MHL (Mobile High-Definition Link) sources, meaning you will be able to plug your smartphone into this HDMI splitter switch and enjoy your mobile contents on a big screen. All of these connectors are coated in gold, so you won't have to worry about losing the quality of your signal, as well as ponder about the transmission of the said signal. In addition to a regular couple of RCA outputs, the model also incorporates a TOSLINK connection that will allow you to plug an amplifier in and enjoy that rich quality sound you always wanted to experience. So, to sum all of this up, the Goronya HDM.MTX.FBA001UK is the kind of quality model you could easily recommend to just about anyone looking for a switch, but an additional HDMI output makes this HDMI splitter switch an absolute must-have for those customers that own a pair of different displays and would like to utilise both of them. 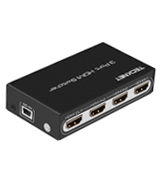 What Is an HDMI Switch? Practically any modern home is filled with all sorts of devices that are interconnected and the problem of tangled cables and insufficient ports is relevant to the majority of people. 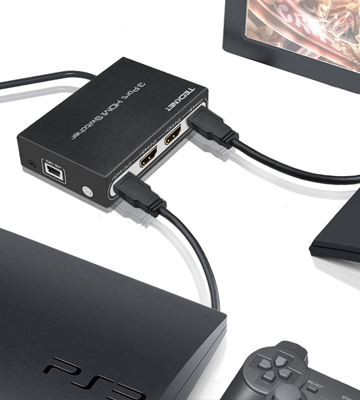 An HDMI switcher can help you kill two birds with one stone, though. 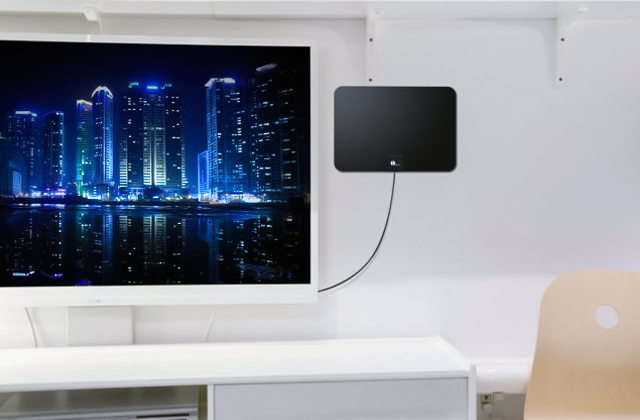 The gadget lets you run several devices through it and then connect them all at once to your TV. As most models of modern televisions still haven’t caught up in terms of ports, your set likely has just one input port. 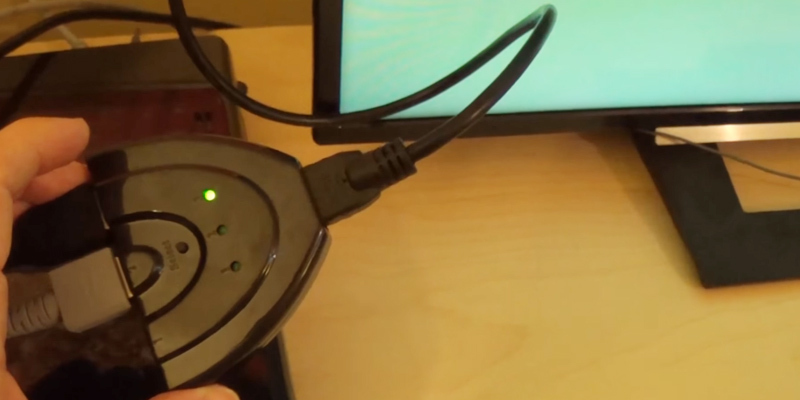 So the best way to connect your blue screen to a DVR, a DVD player, some speakers, and any other audio sources is to use an automatic HDMI switch. 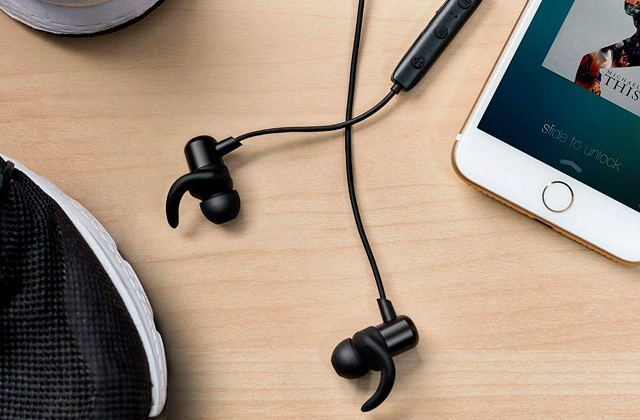 This kind of device usually has a cool smart design that makes it easy to hide it amid your other gadgets so it won’t stick out like a sore thumb. If, however, you take pride in a high-tech collection, luxury colorful models are available as well. You can even get one with a cute print for your kids so they can watch their favorite funny cartoon on DVD, Blu-ray, or even the DVR. 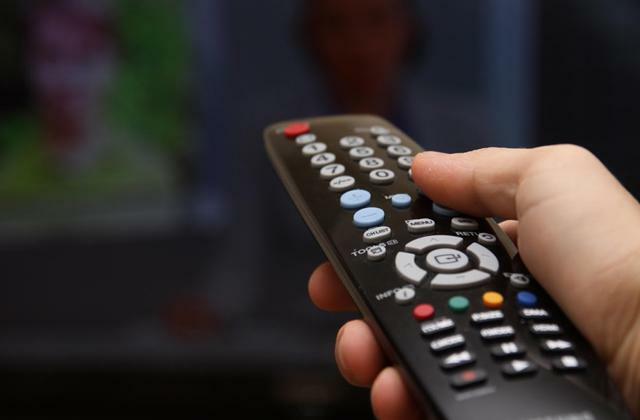 Try to find a switch box that is durable with a strong metallic frame as these devices are often hidden away behind wall-mounted TVs and, if they happen to fall, could sustain serious damage. Hopefully, our HDMI switch review will be helpful and you could likely use a brand new flat screen LED TV to take full advantage of your new tech. 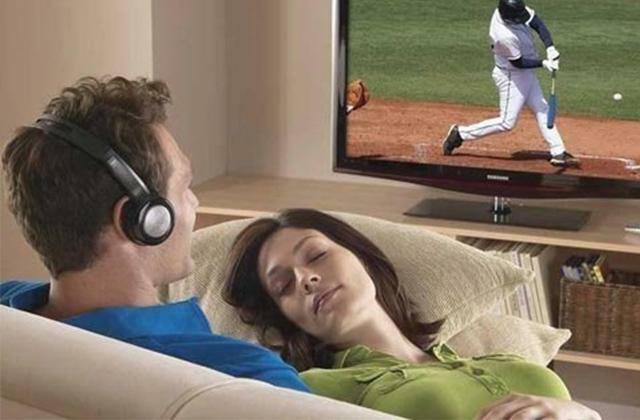 And, of course, consider getting a DVD player so you can always enjoy your favorite movies. 2. Geoffrey Morrison HDMI 2.0: What you need to know, CNET. September 16, 2013. 3. Kate Evelyn How to Use an HDMI Switcher, Techwalla. 4. Tracy V. Wilson How HDMI Works, HowStuffWorks.